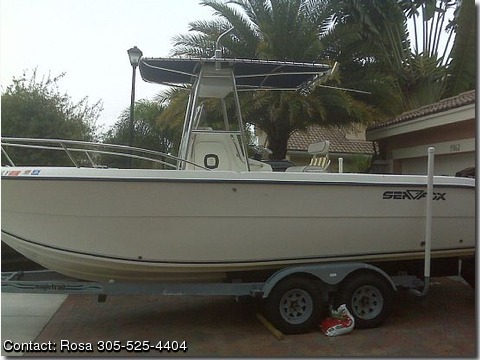 GREAT BRAND NEW 2002 SEAFOX OPENFISHERMAN 256. THIS BOAT HAS AN AMAZING MINT CONDITION LOOK. 225 EFI WITH LESS THAN 20 HOURS. THE BOAT HAS A TOILET/STORAGE AREA IN THE CENTER OF THE CONSOLE. CAPITAINS BENCH AND 4 THROUGHOUT THE BOAT. WHEN HURRICANE WILMA CAME 3 YEARS AGO THE WHOLE ENGINE WAS REPLACED BRAND NEW. THIS BOAT ALSO HAS 2 LIVE BAIT WELLS. IT HAS TWO (2) OUTRIGGERS. DEPTH AND COMPLETE MAPS OF EVERYWHERE IN THE NAUTICAL OCEAN. LOWRANCE WAS PURCHASED 2 YEARS AGO FOR $1,200.00.